It’s amazing how far tea has travelled from its origin China in the Far-East to the North-West of Africa to Morocco. The MingDynasty voyages of Chinese admiral ZhengHe, he commanded the treasure fleet for the expeditions and during his fourth voyage, he reached Hormuz in the Persian Gulf and from there on to the Arabian Peninsula and East Africa. Although little is known about ancient relations, there is evidence of early trade connections and written record of the journeys of Moroccan scholar and traveller Ibn Battuta to parts of China. Who most likely has heard the first news about the fleet of Chinese Treasure Ships visiting Arabian peninsula or later on when he arrived in Somalia. At the time Admiral ZhengHe was on his sixth or perhaps seventh voyage exploring Africa and Ibn Battuta’s travels are equally fascinating stories. He is most likely the greatest traveller who originally set out to complete Islam’s traditional “haji” pilgrimage to Mecca and wandered for nearly three decades travelling extensively before returning home to Morocco. He recorded voluminous observations, notes, insights and lessons learned. Ultimately compiling his travel journal in the ‘Rihla’ which literally means journey, a very interesting and highly entertaining recommendable book to put on your must read list. Click here for a free download link copy. Chinese tea has become ingrained in Moroccan culture with its own tea art form. With respect to the timely process of making the tea, Moroccans adhere to the saying “Insha Allah”, which means with God willing, all good things will come with time. Touareg tea, also called Tuareg tea, Mint tea or Moroccan mint tea is a flavoured tea prepared in Arabian countries, France, Islamic Africa and Spain. 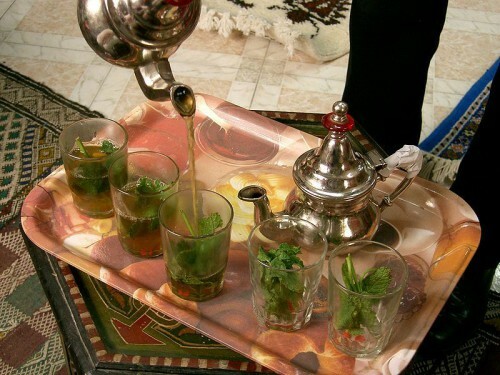 Mint tea is central to social life in Maghreb countries. Tuareg comes from the word Targa, the Tuareg people of the North African Sahara, whose camel trains historically ran the Saharan trading routes. Ancient tax records show that Arabs were trading with tea as early as the 9th century, but in Europe, the trend did not take on until much later. According to the Moroccan trade ministry, Morocco imported more than $56 million worth of Chinese tea during the first half of 2006. Morocco is considered the first importer of Chinese green tea worldwide and China its main provider. With a preference for gunpowder tea (珠茶 zhū chá), a form of green Chinese tea produced in Zhejiang Province of China in which each leaf has been rolled into a small round pellet and derived its English name due to its resemblance of black gunpowder grains. Maghreb Mint Tea Wikipedia: The method of preparation of atai is relatively complex and varies from region to region. It is normally sweeter in the north of Morocco than in the south, and in some places, pine nuts are added. In the winter, if mint is rare, sometimes leaves of wormwood (Chiba or Sheeba in dialectal Arabic) are substituted for (or used to complement) the mint, giving the tea a distinctly bitter flavour. Lemon Verbena (louiza in dialectal Arabic) is also used to give it a lemony flavour. 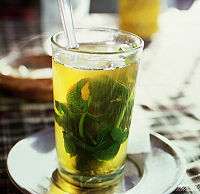 An authentic recipe follows here below, for a variation on Moroccan Mint tea my style, click here.